Hey ya'all...sorry been so quiet lately, I've been busy in Mexico! We did lots of pits. Including, of course, Sótano de las Golondrinas, a 1200-ft single drop open-air pit. I do believe it is the deepest open-air pit in the world (that is known, at least! 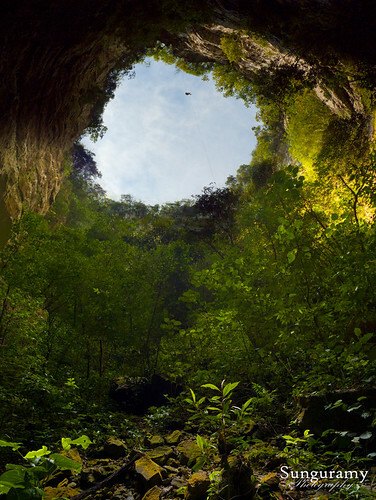 there is so much in Mexico left to be explored and is is the land of huge pits!) Seriously, it dwarfs TAG. TAG, 400, 500, 600ft single pitches are huge pits. Mexico? That's *standard*. I climbed almost a mile of rope in 5 days, half a mile in the last two days between bouncing HuaHuas multiple times (600+ft) and Golondrinas! Our team in front of the house we stayed at. I'm in green. Those shutter-looking swinging doors go to a toilet...yes it's open-air...with an AMAZING view. Best. Toilet. Ever. And the video I put together is here!!! Wow – I'm jealous. Looks absolutely brilliant. Great photos - why weren't we invited on the trip? Anyone is invited to join the VBATS and come on trips! It's a totally open group. There is required training, but trips like Mexico we start small with 300ft stuff and work up during the week so you'll know quickly if you have the right skills. If you already have good srt skills it'd probably be okay to just come to it. Usually, two good Whitesides rappels are required (700-ish ft single pitch rappel). Although, of course, more practice is always best. I recommend if you want to join us next year you get an 18 inch rack (or 24 inch rack) and train with it. It's possible to do Golondrinas even on a 14" standard rack but it is slightly more difficult, especially if you are a lightweight. Practicing for worst case scenario we usually assume a flat 10lb/100ft (although it is more like 8lbs/100ft worse case, but train hard so it's always easy is our motto!) You can do weighted rappels on short stuff by just adding 100lbs to the bottom of the rope, rig in, and rappel, that would simulate Golondrinas perfectly well. It just doesn't give you the experience with controlling through the change in rope weight is all. 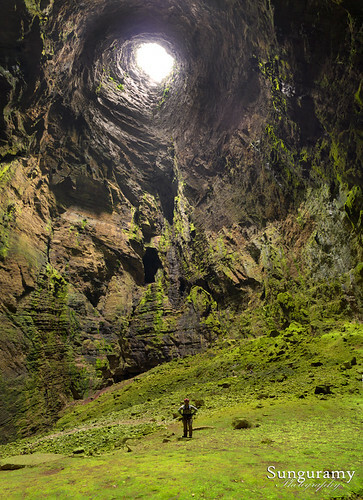 This is an annual trip, and this year it will be two weeks rather than just one so there will be some time for beach, rappelling into swimming holes, and some hot springs and such as well rather than cave-cave-cave-cave only. You can fly in to Mexico direct and drive to Aquismon meeting up with us there, or fly into Texas and meet us at the border. Standard to border cross the Saturday after Christmas. Two weeks starts then! And for fun...I kept note of fun quotes...some make more sense if you were there I guess, but enjoy our horrible crazy minds! "If we all work towards 69 on this trip, it will be an excellent trip!" - TinY, when driving by a sign that said "Future Corridor of Hwy 69"
I guess that you guys uses rope-walking to climb out of these big pits; roughly how long does it take to get out of Golondrinas? (And am I right in thinking that golondrina means swallow, not just any old bird – though the ones in the video didn't look much like our (British) swallows)? I can't answer about the SRT part but you're right in that Golondrina is Spanish for Swallow. 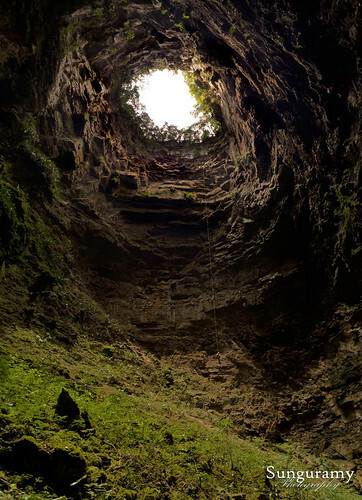 The cave's Spanish name Sótano de las Golondrinas means Basement of the Swallows owing to the many birds which live in holes on the cave walls. These are mostly white-collared swifts (vencejos in Spanish) and green parakeets (periquillo quila). Yes we ropewalk (us-style). meixo is ropewking territory! although original it was done on prussic knot and people specially the locals do frog it. A fast climber does Gondrinas in 40-45 minutes. Typical pace is 1hr15 to 1hr30. I was sick and having my lungs full of mucus made breathing slightly difficult and I did it in 2 hrs although all my training I was right about 1.5hrs. And yes I can confirm Golondrinas is swallows in Spanish. Enjoyed your video, thank you Amy. Amy - Great photos and video. Brought back memories of a visit to Huahuas and Golandrinas that I did many years ago. In 'Golly' I vividely remember the flocks of green parrots flying around the shaft. Best were the circular rings (polos) the swallows made in the sky above the entrance before the birds would peel off and dive down past us to their nests. I also remember the floor was something of a mirage caused by the subtle variations in green vegetation as you descended. Never really knew when you were getting to the bottom until you landed - did you feel that?. We did the drop on Petzl Stops and frogged out as that was the kit we had for our other trips in Mexico. Golly was just a side show on a much larger expedition. I looked in my diary to see what times we made and I see it took me 20 minutes to get to the bottom where the descender got pretty damn hot. Three of us prussiked out that day and the quickest did it in 38 minutes, I made 43 minutes, and the last 50 mins, although we were all young and fit. Another Brit team I heard from went to Golly with all the rope they could muster post exped. With all their rope tied together they managed to reach the bottom with eight knot passes each way!! 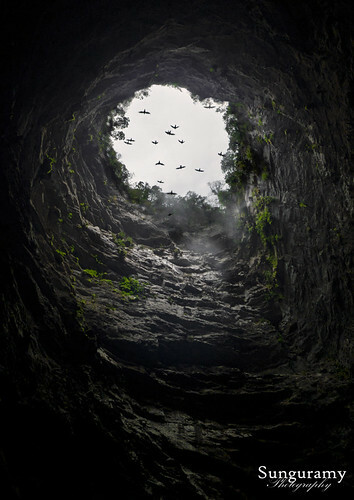 Mexico is a great country and a fantastic place to cave. Anyone inspired by Amy's photos should just go go go. I'd be interested to hear how stops were able to handle such a decent...surely even on your ropes that is a good bit of weight for a stop to be able to start on? Or did you set rebelays? I rappelled at a steady meter/second (sometimes a bit faster...) pace so it didn't take me that long to get to the bottom although yes indeed I kept thinking "okay it looks about another 200ft down" for probably about 800 feet! Ha! It is truly interesting how the mind plays tricks with you when in an enclosed space on such a drop. A true 200-300ft from either side (top or bottom) my brain really had no sense of accurate scale. My racks top three bars (where most the friction is taken) were a bit hot to the touch but still touchable with a bare hand at the bottom. Amy - Of course stops are not ideal! but I've also used one on a 300m drop in PNG. I'm fairly sure the rope we used was 11mm Bluewater, but new and reserved for the big pits so not too stiff. No rebelays. We had someone hold the weight of the rope from the top on a tagline attached to a jammer below you so that we could get over the edge. You have to take the weight of the rope off the stop in order to descend so you soon adopt a rapid flicking action with your control hand. It also helps if your stop is pretty worn. Quite a lot of folk from the expedition did Golly at various times and many on stops. So quite possible but not the best device. I've started to write up a trip report..... enjoy! 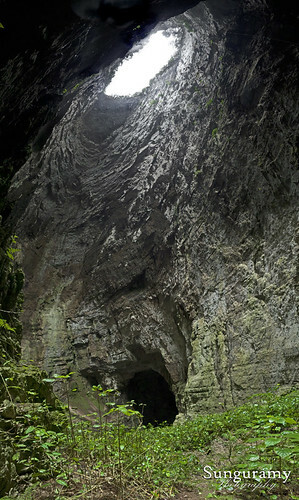 I first heard about vertical caving in summer of 2010, shortly after my first cave trip. I tried it briefly, had a horrible experience, and just about gave up. Nope, not doing that again. I like to live. 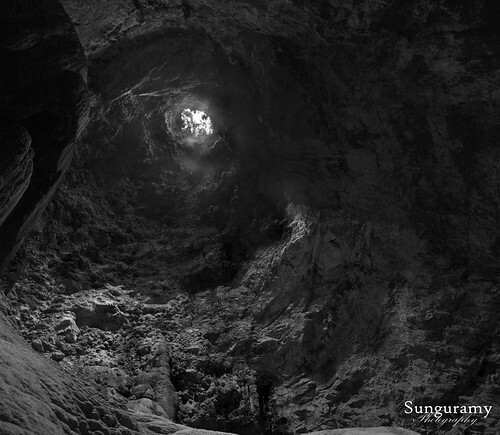 Early 2011, I met some, perhaps better trained (at the very least, better instructors) who started to slowly convince me to try this “vertical caving” thing again. Around that same time, I saw an article about Sótano de las Golondrinas and dreamed of some day going there. Timidly, I got back on rope. Fast-forward until October 2011. A friend in TAG hooked me up with the VBATS®, a group that enjoys being on the long rope together. I was taught proper long rope belay techniques and joined them at Bridge Day (an annual event involving a 876-ft rappel off the New River Gorge Bridge)on the belay team. That experience told me I needed to hang out with these people more, and I joined the team. Still stuck in the flat, glacial-fill land of Michigan, there were very few trained in Single Rope Technique (SRT) nearby, and even fewer with any skills or experience in long rope. I started as most in the area do, frogging, rappelling with a microrack. It’s fine for the short, and in-cave stuff of southern Indiana and Kentucky, and I was taught well – knew changeovers and knot crossings, and a bit of rigging. But, I knew where I wanted to be. As an outdoorsy lass I yearned for the varied and beautiful karst terrain. So, I moved to Huntsville, Alabama in early 2012. I quickly experienced firsthand how my vertical kit and skills needed to change and expand. This isn’t 100ft +/- anymore. This is TAG. My first vertical trip with the Huntsville Grotto I wasn’t able to do a single pit as they were all around 150ft and it had been six months since I’d been able to get on rope…I doubted my ability to climb it! Luckily for me, I was now in vertical caving, and long rope, Mecca. With many other members of the VBATS® at my disposal at twice monthly vertical practices, quickly I was set up and running on a single bungee ropewalker and “proper” 14-inch 6-bar rack. Right now, I was hoping to do “big stuff” like Mystery Falls…Golondrinas was simply a nugget stuck in the back of my mind. For those who don’t know, Mike “TinY” Manke started the VBATS®. One of the people who learned directly from him is Mark Ostrander. Mark has taught a third generation, including Brian Stoltz, who gets a good bit of the credit for training me, a budding fourth generation! This proved to be an interesting test, of sorts, when TinY, Brian, and I went to Mystery Falls in Spring of 2012. It was said that the training passes on very well generation to generation, and I’ll admit I felt proud to have the “seal of approval” from “The Man” himself. Feeling great with the success, I soon moved on to conquer Surprise Pit. It was during this climb, however, that I learned a single bungee system would not work long-term for me, nor would my chest harness. Having very large protrusions from my chest (“ahem”) it was very uncomfortable and rubbed me the wrong way. This would need to be solved for longer climbs with a new customized chest harness. For the climbing system itself, the torque a foot ascender placed on my ankle was getting to be too much with the 404-ft climb; I couldn’t imagine lasting much longer with it. The obvious, of course, was to move upward and onward to a double bungee system. This had many problems, from compressing my chest cavity and enganging internal organs from the chest harness pressure collapsing my chest inward as it was pulled down over my “protrusions” to hurting my lower back with the pull of the bungees to the point of tears within 10 feet of climbing. Dejected, I figured I would never climb more than around 400-feet. Surely, I could never do Golondrinas now. In the end, persistence, and ingenuity, and a bit of inspiration from some “old-timers” in SRT, paid off. A system we dubbed “Bungee and a Half” was born, where the foot ascender is bungeed to the seat harness by the halfround, and the knee ascender is bungeed over the shoulder to the back of the seat harness, just like a single bungee system. This solved every problem. I worked on tuning my new-and-improved system, and was quickly climbing with ease and skill. I loved how it worked for technical rigging as well, just pop the chest roller and pop the foot ascender, and it’s a Texas-style system! By this point I’d already done a rappel at Whitesides with the VBATS® on one of our training days there. I had to hike out though, not able to climb the distance on my single bungee. This time, our second training day, I put my new system to the test. To the lip, Brian and I took 45 minutes. Perfect! Although, my lack of desire for big wall stuff was confirmed on this trip. I’m a cave girl, not a wall girl. Now began the training for Mexico…for Golondrinas. Quicker than I ever imagined, it was in my grasp. I ran a lot of rope in the two months leading up to the expedition. Fast, slow, trying to find my perfect pace and perfect my stride. Those who ropewalk know – it’s all in the technique. I got it tuned exactly right, to the point I did’t even need to self-start at the bottom! And then…the day came. I joined the VBATS® caravan to Mexico at the new NSS office. There were three of us riding in TinY’s truck, myself, Amber, and of course, TinY. Along with us were two other vehicles, carrying Larry, Burnis, Tim, Jon, and Dutch. We drove to Louisiana to pick up Sharron and Jordan. There were already two members in Mexico at Mike’s house (PD and Jane), and the other three (Mike, Lisa, and Peter) would join us later in Mexico (none of the Mike’s named here are the same Mike, by the way. Mike who owns the house was not on the trip. Mike “TinY” is TinY in this writing. Then there is the Mike who is on our trip.). The border crossing was uneventful at a brisk 3:00am in the morning. It was so quiet, we decided to continue on although it was not yet daylight. We made it through the border lands without incident. Most of us already knew each other, and between being sleep deprived and very excited, jokes quickly started. You see, when caravanning through Mexico you run into slow drivers, mostly trucks (LOTS of sugar cane!) and you just have to pass them. Our FRS radios came in handy with all the blind curves. TinY’s truck was the lead, and we’d pass, and then direct the others of when it was clear via radio – they were passing blind. Questions like, “Is the rear in yet?” with replies of “Yup, all in the rear!” quickly digressed into…rather interesting banter! We also quickly learned what “Topés!” are – speedbumps! Usually, we’d see them in time to slow down. Other times, well, I hope you like flying cars! One we hit so fast we couldn’t even warn the van behind us in time, and watched as they had at least a foot of air between their tires and the road! Overall, road conditions in Mexico were amazing, however. TinY often commented “WOW they paved this too!?! ?” We only ran into one road reminiscent of the tales us Mexico-newbies had been regaled with. It still had concrete runners as high as two feet above the dirt, that you had to keep your tires on or they’d fall off…and you’d be sitting on your axle. After a LOTTTT of driving we made it to Mike’s house in Aquismón. PD & Jane did an amazing job getting it ready. It’s not a hotel, it’s way BETTER than any hotel in Mexico you could hope to stay in. That being said, it is a house, you’re a big boy fend for yourself! But, everyone did a fine job of cleaning up after themselves and leaving the place nicer than it was when we came. It was nice to arrive early and get the lay of the land in the daylight, hang out, meet new friends, eat, drink, and be merry. We split up and geared up, half doing high side half doing low side, and then we switched mid-day. Apparently, we are the local entertainment. Three local village boys, ages 5, 7, and 8, came up and watched us. Through my broken Spanish I was able to warn them “danger” when they got too close for comfort to the edge, ask them the name of a plant that was some kind of bromeliad (and I can’t remember their name for it now), and get their ages and names. It was actually rather fun interacting with the local children. A lot of them over the week would stare and point at my chest (I am rather well-endowed) but in general they seemed amazed whenever they saw particularly myself or one of the other women along doing all this. It was clear in their culture women never “do things like this”. Although, our group as a whole provided much entertainment and was the cause of much laughter. We’d point at ourselves and say, “Crazy loco Gringos, si?” and get rounds of laughter in agreement! As we left the pit, I learned why TinY had picked up bags of candy…the kids there LOVE candy, which makes sense as being such a frivolous item I doubt they really ever get it. It was slightly weird to my Western brain though, which kept thinking, “strangers don’t give candy to children!” Here though, it is accepted and much appreciated. We’d have kids trailing our vehicles down the road to get more, and parents (if around) would thank us or give approving smiles. Back in town, the stories of wandering around not being able to find food for dinner held true. Lots of places were closed, and one that was open did not have enough food to feed all us Gringos! I spotted a place open in the center of the square, and we headed over. This place, a tent with two plastic tables and chairs, had amazing food, and enough of it. I particularly liked their hot cinnamon pineapple drink, and their “smoothies” of sorts. All the food here was delicious, and so very cheap. It was 1000 pesos (about $130) to feed all 11 of us, and we all ate multiple courses and had multiple drinks. Tuesday brought another lovely sunny morning, although I woke up with allergies. I never thought about allergies in Mexico, but I guess it makes sense. Next time, I will start to get allergy med into my system before going (protip for others who are prone to allergies!). Not to be deterred, I attacked the day with purpose! We had three pits to do this day, Huesteca (425ft), La Laja (180ft) and an “unnamed” 100-ft pit that the locals called La Niña. We again segmented into groups to go rig the various pits (and two rig points in Huesteca). I was put with Tim, PD, and Amber rigging the never-rigged-by-our-group high side (so….it was more than 425 feet…probably about 450ft if I had to guess). Tim, being the excellent rigger he is, had it done quickly and with help from PD got the rope pads all set and was soon descending with the machete. (Oh yes, did I mention that the lead rappeller gets to cut their way through the jungle while on rappel?) Soon, all four of us were down and the low side joined us across the way. I myself had a wonderful landing…aiming for what seemed to be a flat-ish stable rock rolled, landing my arse in a tiny sprig of Malamu Hair. It’s a nasty plant with small little hairs on it that burn, and for me, made my thigh start to cramp up some too. They are too small to see to pull out, so you’re SOL if you touch one. Then, soon as I stood up I had a lesson in surfing as I rode the entire unstable rocky slope about six feet, landing unceremoniously on my arse…again. At this point, the beauty of the pit was being quickly lost on me and I just wanted to get on rope and get out of there! I think the decision was made to not rig this side in the future because the entire slope at the bottom is tennis ball to bowling ball size rocks that just roll. Nothing is stable, it’s very easy to fall as I did such a lovely job of demonstrating (and I wasn’t the only one!). Amber and Tim climbed out first, then I climbed with PD. It was a grand time. He asked if I had a partner yet for Golondrinas, and I said, “Nope, I just need someone smooth which I knew was Tim or TinY, but you’re smooth too!” and it was then we decided to be climbing buddies as we had similar pace preferences and worked well together. PD and his wife, Jane, quickly became two of my new favorite people! As I said, the VBATS® are a lovely bunch and I’ve met no one but nice folks! At the top of Huesteca I’d about had enough for the day between allergies and Malamu Hair and new bruises on my back from rocks rolling into me (including a large bruise by my right kidney that was particularly sore!) but there were more pits we had to do. Our group joined up with Jon, Larry, and Peter to go do La Laja. We bounced it fast, and then a few of us moved on to the third pit, La Niña, and then de-rigged it. We all met back up at the low side of Huesteca and headed back to town. Again, places were closed, or did not have enough food, except for the lovely place in the middle of the square of Aquismón where we happily ate again, still about 1000 pesos but now we were 14 strong! It’s amazing how much awesome food you can get for so cheap in Mexico. Guys ......Please!!! Not the Stop VS Rack debate again! !